This is a tribute to the self-titled “blue-haired wonder internet phenom,” Champagne Joy, who was a sort of Joan of Arc for the metastatic breast cancer community. She made it her mission to peel back the pink ribbon and look at the disease for what it really is. Her hashtag-turned-nonprofit-community #Cancerland was her life’s work and has been featured by social change powerhouse publishers such as Refinery29, Essence, BBC, and the New York Times. Part of that work recently was helping organize the AnaOno x #Cancerland show for New York Fashion Week, titled “Exposed.” The interview we conducted to cover that event included a lot of very inspiring and enlightening opinions by Champagne Joy about her recent projects and her prospective ones. In light of her passing, our team chose to release this interview so that we were sure we did all we could to help her legacy live on. Note: This interview has been edited for clarity and consistency. Trigger warning: audio files play clips of Champagne Joy speaking during the interview. IHadCancer: So, just to get the big question out of the way: why have a fashion show about breast cancer at all? Champagne Joy: If 1,500 people didn’t die a day of this disease, maybe there would be time for new awareness. But there isn’t. So people are just going to have to become aware as we go along. My goal really is to, at this point, find a way to keep people alive and get money into research toward a cure while they’re being kept alive. With metastatic breast cancer, we are at a tipping point which– a mirror of right before AIDS got its cocktail. And so as we bury people every single day — young women that should have had a life ahead of them — we’re finally at a point where, if we can remove the impediments, we can at least see this become a chronic disease and during that time, if research is put toward a cure, we could do it all. 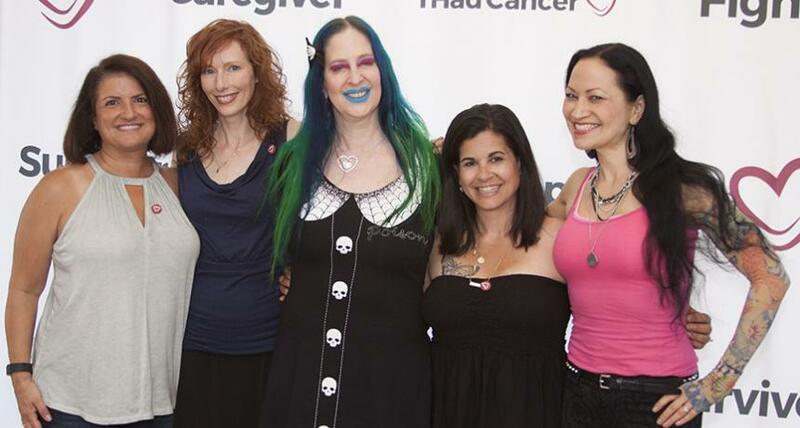 I really had this notion of doing a fashion show for breast cancer patients at New York Fashion Week, with actual non-models, with actual people with the disease. When Dana Donofree and I came together on this idea, it’s almost like “Boy, we’re so stupid, we should have done this together sooner.” Once we said it to each other, it was so obvious and so good and so fantastic. It was so much about this casting of women and this idea of showing the world what beauty really is. IHC: Mira Sorvino opened the show by saying “We live in a world of conformity.” What does that mean to you? C: We live in this world where there is an arbiter of what people should look like and then we all follow suit, and what sets this apart is that we’re going in the other direction. We’re becoming the arbiters of what should be considered true beauty, which is your own individuality. As I find often with the disease itself, it’s not what people think it is and you really have to get them to understand.